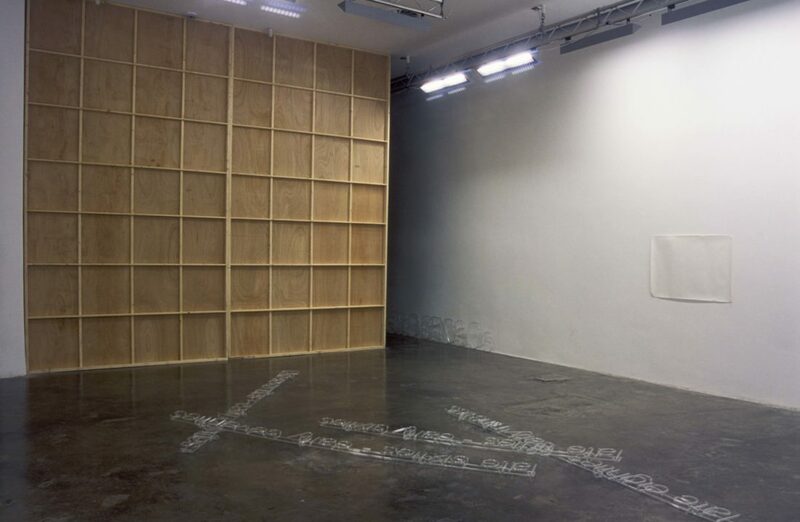 An exhibition at Project Arts Centre, Dublin in 2003 which brought together three bodies of work in an installation which created links and connections between the individual works, suggesting an interweaving of biographical and historical narratives. The Project Arts Centre curator Grant Watson wrote an essay on the exhibition which can be read here. Decade-ism, Years, and Decade-ism (early & late) are each sculptures in the form of texts denoting years, decades and periods of time. Each is fabricated from clear glass tubes used in the making of neon signs. The tubes are do not emit any light as they are not filled with gas nor connected to electric current, rendering the objects transparent and at times nearly invisible. The Correction Drawings I-IV is a series of works on paper. Each is a drawing made after the same post-mortem photograph of the artist’s father taken during his wake. The starting point in these drawings was to make an image that addressed the uncanny quality of the photographic representation of the dead man’s face. Drawings were made to correct the ‘incorrect’ facial features based on prior knowledge or memory. This process proved impossible and a process of subtraction of the ‘incorrect’ details of the image resulted in area of the paper being cut away. Progressive attempts resulted in substantial areas of the paper being cut away in the form of circular holes. Correction Drawing IV was featured again in a later work Sequences, Scenarios and Locations Part I After Hansel & Gretel where the disk like paper cut outs were a prop in the a reworking of the fairy tale where Hansel uses bread to find his way out of the forest after being abandoned by his parents. The original photographic image was used again in Sequences, Scenarios & Locations Part II. Seminal II (after the year of the artist’s birth and Colliers Encyclopaedia Yearbook 1970, covering the year 1969) is a three-screen slide projection installation. Over 300 photographic images appropraited from Colliers Encyclopaedia Yearbook 1970, covering the year 1969 were reproduced as slides. The Encyclopaedia Yearbook is from a set purchases by the artists parents in the 1960s from a American travelling salesman resulting in a particularly ‘American-centric’ representation of the world being a central part of the artist’s childhood.